Click on this link to see the animation of the theme. The links must be opened by QuickTime player. QuickTime allows you to control the progression of the animation over time. The following is a zip folder. The folder has a PDF file and other info files concerning colors and text of the images. Adobe Reader 9 is best for reading the PDF file. The Global Community is declaring a moratorium on immigration all over the world, on all applications for immigration, until applicants from any religious or cultural background have satisfied completely the Global Community standard for a population fertility rate of 1.3 children per family. The problem with world overpopulation is everybody’s problem. We are all responsible. Until tangible progress is made no immigrants should be accepted. That is Global Law. It is the use of a very high fertility rate to conquer a nation, and that could mean as many as or more than 2.1 children per family. It is a form of cultural and/or religious aggression and invasion by having a much too high number of new born babies. For instance, there has been a rapid increase in population among Muslims to the extent that in fifty years all of Europe and North America are expected to be mostly Islamic. The influx of Latino immigration into the western states of the USA will also have the effect of a population warfare. Earth management includes problems with immigration in the world. We have shown that all aspects are inter-related and affect one another. Population warfare amounts to increasing demands for more resources but nations are already fighting for what is left of natural resources on the planet. Today, we need five healthy Earths to feed the world population. And population warfare also amounts to a specific cultural or religious group of a population trying to gain control of a nation by increasing its size and affecting the political outcomes of government in power. Who, then, are those who deny life for the glory of God? All life on Earth is fighting for survival and freedom from development, pollution in all its forms, overconsumption and overpopulation. The higher purpose of humanity is to serve God by propagating Life throughout the universe. Humanity will evolve spiritually to fulfill God's Plan. Soon God will show us the way to reach the galaxies. (Read about the Teaching of the Soul for details ) The Global Community proposal of a world population of 500 million does not in any way contradict God's Plan for humanity. On the contrary, it reinforces the Will of God for the diversity of Life throughout the universe. By accomplishing our higher purpose we will be able to propagate trillions of life forms over the entire universe. Beside, with such a small population, there is no doubt that our species would last at least a million years. That is 0.5 x billion x 1 million = 0.5 x 10 15 person-years. But if we let our population rise to about 20 billion then we may not survive more that 1,000 years or so. That is 20 billion x 1,000 thousand = 2 x 10 13 person-years. In order words, if we exercise restraint now the total number of human beings who will be on our planet later could be at least 25 times greater than it would be if we allowed the population to increase to 20 billion. Who, then, are those who deny life for the glory of God? For our survival as a species and for God’s sake one child per family is more than enough. Let us restrain ourselves! Let the community be the other child our child needs as a companion. Throughout Global Dialogue 2011, we want the Peoples from all nations to participate with positive ways about how they can and will restraint themselves to decrease world population to a sustainable level for the protection of all life on our planet. No specific populations are being targeted for having an out of control population size. We are all responsible. Read about the fundamental definition of the Global Community and how it relates to other global concepts. One of the most important factors in our lives is the inter-connection we now have to others, to other countries. Through these connections we are able to create changes for good on a global scale. We are all linked to others in faraway places on a much deeper level, and we are working together to keep our planet healthy, productive and hospitable for all people and living things. Indeed, we have become the Global Community, the human family. Every human being now lives within " a Global Community." This is his (her) global private community. One imagines he is inside a glass bubble ~ everything he can see from this glass bubble is his own " global community ." Wherever we go, we are inside " a Global Community." Everything, every living creature there, interacts one upon the other. Influences inter-weave and are responsible for causes and effects. We are worlds within worlds orbiting in and out of one another's space. The Global Community has given back responsibility to every citizen on Earth. Everyone shares responsibility for the present and future well-being of life within the Global Community. We will work together in working out sound solutions to local and global problems. It would be wrong and dishonest to blame it all on the leader of a country. Most problems in the world must find solutions at the local and global community levels (and not assume that the leader alone is responsible and will handle it). There is a wisdom in the ways of very humble people that needs to be utilized. Every humble person deserves to have ideas respected, and encouraged to develop his or her own life for the better. Sound solutions to help manage and sustain Earth will very likely be found this way. Everyone can help assess the needs of the planet and propose sound solutions for its proper management, present and future. Everyone can think of better ideas to sustain all life on Earth and realize these ideas by conducting positive and constructive actions. The Global Community can help people realized their actions by coordinating efforts efficiently together. For centuries Canadian society has shown that the diversity of people, their ways of doing things, can be an advantage to living together and that the diversity can also bring Peace and prosperity in a nation. Diversity can actually be the root cause of Peace. The Canadian experience has shown that this has been the better way to bring about the event of Peace in the world, and not the military option. Multiculturalism has led to higher rates of naturalization than ever before. With no pressure to assimilate and give up their culture, immigrants freely choose their new citizenship because they want to be Canadians. As Canadians, they share the basic values of democracy with all other Canadians who came before them. At the same time, Canadians are free to choose for themselves, without penalty, whether they want to identify with their specific group or not. Their individual rights are fully protected and they need not fear group pressures. Multiculturalism is a symbiotical relationship between Canada, the Canadian people, and the people of the world. Multiculturalism is a symbiotical relationship between Canada, the Canadian people, and the people of the world. Our citizenship gives us equal rights and equal responsibilities. By taking an active part in our civic affairs, we affirm these rights and strengthen Canada's democracy, ensuring that a multicultural, integrated and inclusive citizenship will be every Canadian's inheritance. A global symbiotical relationship between nations is more than just a partnership, or an economical agreement such as the WTO. The WTO is about a trade partnership between nations. Of course it is a bad idea to be a member of the World Trade Organization ( WTO). There are no advantages! The fundamental criteria is not being fulfilled. It just does not work for anyone except when you have an army to knock down any member who does not do your five wishes and plus. A membership in the WTO is not needed and nations should instead seek relationships with fewer other nations only if needed. Certainly it is better to seek an economic relationship with another nation we can trust than with a hundred nations we have no control on and everyone of those nations has a say in the governing of our nation, its environment and social structure. The WTO only offers illusions to profit the few wealthiest people on Earth. They say "become an industrialized nation as we are". But that is the biggest illusion of all. To become an industrialized nation is far from being the best solution. The best way and solution for any nation is to follow the Scale of Global Rights. 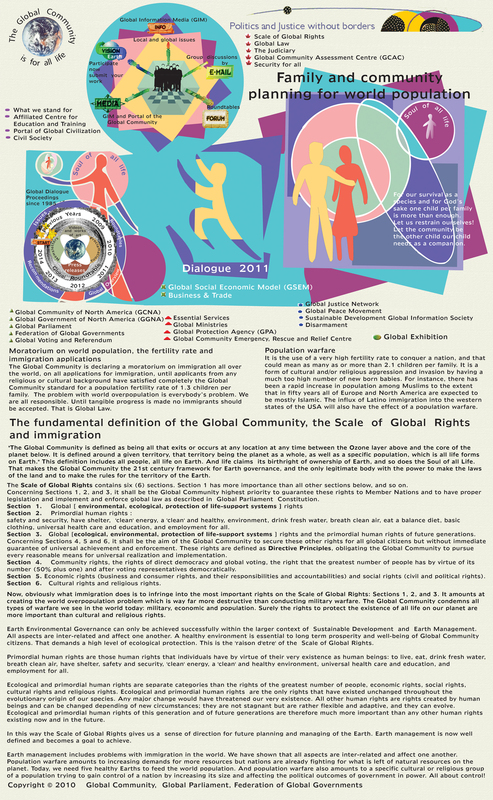 Right on top of the scale are the ecological rights, the global life-support systems, and the primordial human rights of this generation and of the next generations. Economic and social rights are not the most important. That makes a lot of sense!